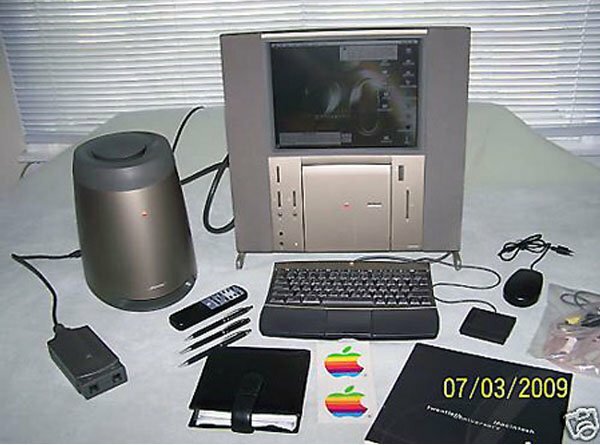 Don’t miss out on opportunity to own this rare Twentieth Anniversary Macintosh (Tam) computer currently on sale at eBay. It is one of just 11,601 which were produced worldwide back in 1997. 399 of which were held to spare parts and it originally retailed at $7500 with concierge setup in your home. The TAM came with a special 75 key ADB keyboard which featured leather palm-rests and a trackpad instead of a mouse. The trackpad could be detached from the keyboard if desired, with a small leather insert found underneath the keyboard ready to fill the gap. Due to its size (and its origins) the keyboard does not feature a numeric keypad. When not required, the keyboard could slide under the TAM’s head unit, leaving the trackpad exposed for continued access. The TAM came with a remote control (standard with the Apple TV/FM Tuner card), but also featured buttons on the front panel that could control sound levels, CD playback, brightness, contrast, and TV mode. The pre-installed operating system was System 7.6.1 (requiring the TAM’s special CD for installation), but this could be upgraded as far as Mac OS 9.1. When Steve Jobs returned to Apple east of the project and have the most destroyed making this a unique piece of computer history. Check out the auction on Ebay.